It’s not surprising that Isotoner has come out with smarTouch gloves. While the most basic of touchscreen-friendly gloves apply conductive material to the glove fingertips, Isotoner incorporates conductive thread into the makeup of each fingertip to transmit electrical impulses from your fingers to your touchscreen. The patent-pending technique gives users more effective and accurate use of touchscreens, and at around $25, these gloves are affordable. One word of caution: Isotoner’s solution isn’t one-size-fits-all. Those with shorter fingers may have a hard time finding a pair of smarTouch gloves that fit, well, like a glove. 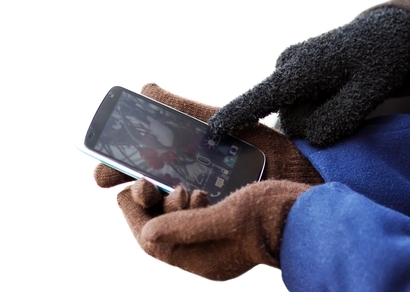 We defy anyone to manipulate a touchscreen in ski gloves, what with their extra insulation and bulky fingers. Wouldn’t it be great to have a pair of touchscreen-friendly ski gloves? Your wish is granted with the eGlove. It’s thick enough to protect your hands while hurtling down a mountain, but it has conductive patches on each of the forefingers and thumbs. Moderately priced for quality ski apparel at around $50 and with elastic cuffs and wrist straps for a customized fit, these are the ski gloves you’d choose even if you didn’t have to worry about using your smartphone. Maybe you prefer leather for keeping your mitts warm in winter, but no one wants to mar the delicious and expensive look with conductive patches on the fingertips. You don’t have to give up the convenience of using your touchscreen device when leather gloves are your hand protection of choice. With Leather Touchscreen Gloves by Mujjo, you get plush lambskin gloves that take advantage of nanotechnology to make the fingertips conductive, allowing you to work the ATM, answer the phone or send a text. They are leather, and at about $103, they carry a leather price tag. In other words, these gloves aren’t the answer for the touchscreen user on a budget. If you have a pair of gloves you love, you can take matters into your own, um, hands. GizMag reports that, when applied to a glove’s fingertips, a conductive polymer called AnyGlove makes them touchscreen-friendly. AnyGlove goes on in liquid form and, once dried, it enables you to use your touchscreen devices with ease. The product isn’t a permanent fix, however—it wears off anywhere between a few days and a few months and will need to be reapplied. At under $15, it’s an affordable solution that lets you keep and use a favorite pair of gloves.